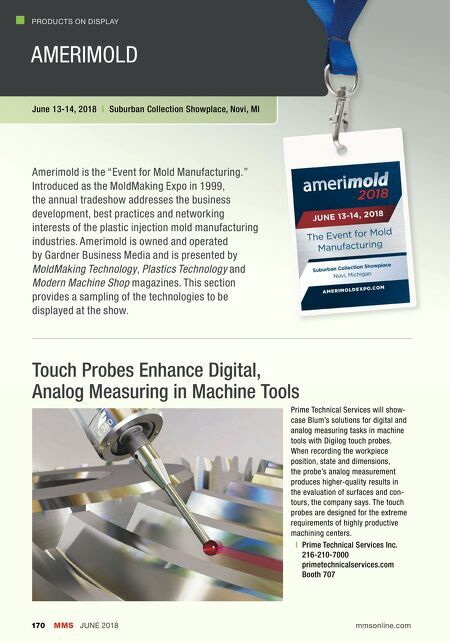 PRODUCTS ON DISPLAY June 13-14, 2018 | Suburban Collection Showplace, Novi, MI Touch Probes Enhance Digital, Analog Measuring in Machine Tools Prime Technical Services will show- case Blum's solutions for digital and analog measuring tasks in machine tools with Digilog touch probes. When recording the workpiece position, state and dimensions, the probe's analog measurement produces higher-quality results in the evaluation of surfaces and con- tours, the company says. The touch probes are designed for the extreme requirements of highly productive machining centers. | Prime Technical Services Inc. 216-210-7000 primetechnicalservices.com Booth 707 MMS JUNE 2018 170 mmsonline.com AMERIMOLD Amerimold is the "Event for Mold Manufacturing." Introduced as the MoldMaking Expo in 1999, the annual tradeshow addresses the business development, best practices and networking interests of the plastic injection mold manufacturing industries. 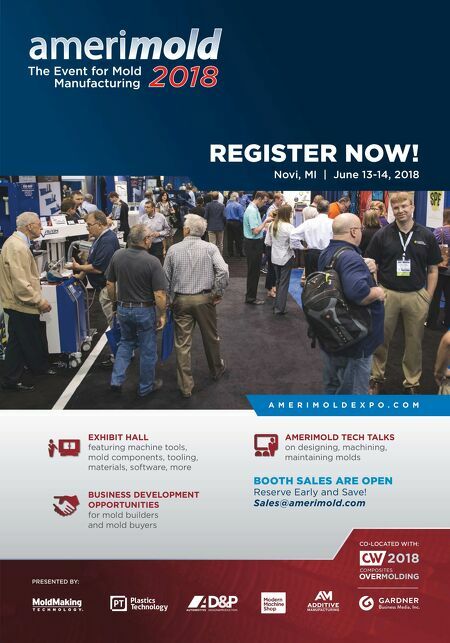 Amerimold is owned and operated by Gardner Business Media and is presented by MoldMaking Technology, Plastics Technology and Modern Machine Shop magazines. This section provides a sampling of the technologies to be displayed at the show.